She is NOT to be reproduced in molds! sealed with polymer Matte finish. This doll is 8 inches tall sculpted in Polymer clay . and will not break easily! very pose-able and playful for her small size. fibers and can be brushed and styled for fun! crocheted cotton and very soft silk. outfit can be easily removed. worry of paint or makeup fading. Yes, this beautiful doll has her own unique Lounge Chair. Painted with acrylics and sealed water-proof! 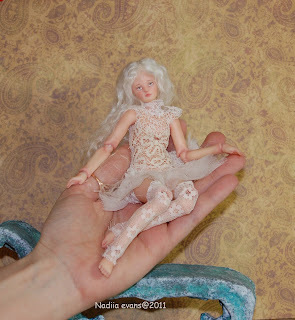 This BJD can be re-stringed if needed, just take off her head plate and untie the nut. Her hands and feet has hook-type attachment style. I am providing extra 1mm elastic cord and wire hook with this auction. BJD are so much work! She was driving me crazy And I believed I have Patients... LOL,... NOT!